Facebook's proprietary instant messaging app is about to bring a new feature to Android users. In 2018, Whatsapp Launched Fast Features and Tested It. Today the company is working to give the Swipe to Reply feature for the Android app. For your information, let us know that the swipe-to reply feature is already available for the iPhone or the iPhone app. For the convenience of users, the WhatsApp Swipe to Reply feature is being introduced. After this new feature comes, you will be able to reply quickly to any message with the help of swipe right gesture. This means that now you will not need to press and hold the message for the reply button. Apart from this, the company is also working on another new feature. This new feature will be known as the dark mode. According to the report of WABetaInfo, the company is working to give Swap-to-Reply features to WhatsApp's Android app. WhatsApp has submitted new updates to the Google Play Beta Program. Swipe to reply feature is available in beta version 2.18.282 of the company. The report claimed that due to technical reasons this feature is not available right now. After making many improvements, the feature will be released for the Android user. It is being said that this feature can be rolled out in some upcoming updates. After the swipe-to-reply feature comes, you swipe the message on the right that you want to reply to. After doing so, WhatsApp will automatically load that message in the reply box. The company is also working on delivering the Dark Mode feature in the app. 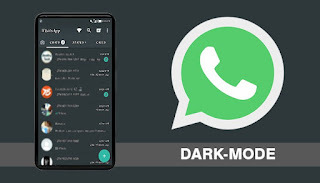 According to the tweets made by WABetaInfo, WhatsApp has started working to deliver dark mode features in iOS and Android apps. There is no mention in the report at the moment that how long will this feature be released. After the introduction of new features, the use of the WhatsApp in the night or in low light will reduce the stress of the eyes of the users. Not only this, this feature will prove helpful in saving the smartphone's battery with OLED displays.